We’re often told that you should never eat anything (or put it on your body) if you don’t recognize everything on the ingredients list. But since most of us have no idea what xanthan gum or potassium benzoate are — or more importantly, what they’re doing to our bodies — we’re decoding the ingredients in the many things Americans put in (and on) themselves with the help of an expert. This edition: OFF! Insect Repellent, which is made from 13 separate ingredients that we’ve broken down in the exact order they appear on the website. 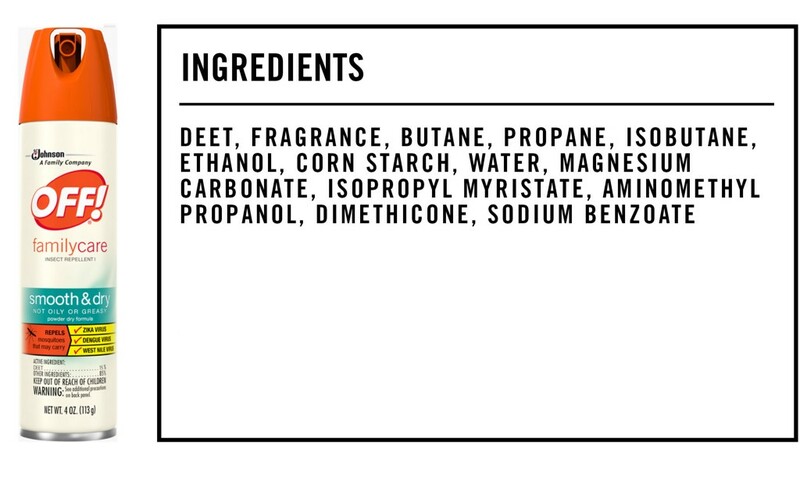 1) DEET: DEET is the active ingredient used in this insect repellent to (you guessed it!) repel insects, and it’s damn good at it: A 2002 study published in the New England Journal of Medicine found that DEET-based repellents provided the most complete and longest-lasting protection against mosquitoes. Despite all of this backlash, a 2014 review performed by the Environmental Protection Agency concluded that DEET presents no risks to human health, non-targeted species or the environment. Naturopathic physician Jennifer Stagg more or less agrees: “I’m less concerned about DEET exposure than I am about being bitten by a tick, and therefore exposing myself to Lyme Disease,” she says. Do not apply over cuts, wounds or irritated skin. Do not apply to the hands or near the eyes and mouth of young children. Do not allow young children to apply this product themselves. Avoid over-application by using just enough to cover exposed skin and/or clothing. Do not use under clothing. Wash treated clothing before wearing it again. With so many ingredients (10 in all) packed into a single blend, it’s no surprise that fragrances are generally the leading cause of cosmetic contact dermatitis (i.e., a skin rash caused by contact with a certain substance). 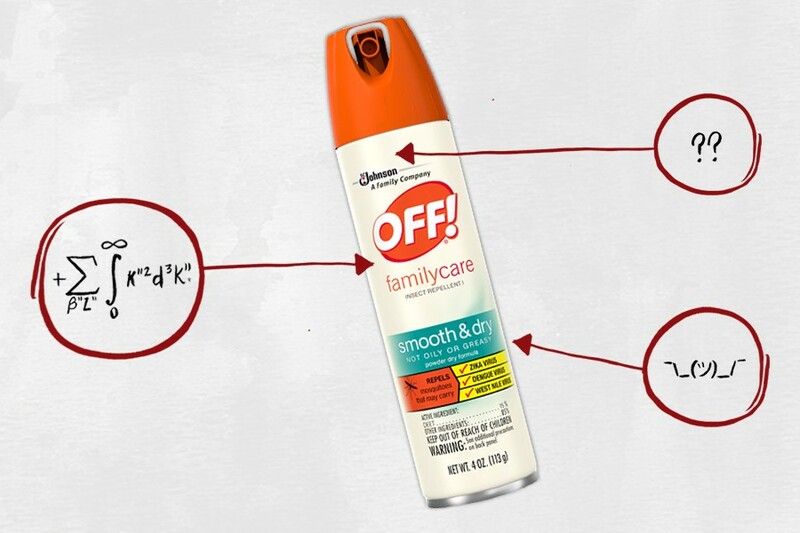 There’s a simple fix if you experience a rash after applying this product, though: Use a different bug spray next time. 3, 4 and 5) Butane, Propane and Isobutane: All three of these ingredients are odorless gases added as propellants, allowing them to help create the “spray.” “Consumers have reported concerns regarding skin or eye irritation caused by exposure to these ingredients, but they’re safe so long as you follow the directions on the product label,” says Dagan Xavier, ingredient expert and co-founder of Label Insight. In other words, don’t spray bug repellent into your eyes. 6) Ethanol: Ethanol is a form of alcohol used, in this case, as a solvent to help distribute the ingredients evenly throughout the product and enhances the skin’s ability to absorb said ingredients. According to the Journal of Occupational Medicine and Toxicology, ethanol can be an irritant, and the National Cancer Institute claims it can be carcinogenic when consumed. But again, so long as you don’t drink this bug repellent or spray it into your eyes, you’ll be just fine. 7) Cornstarch: “Cornstarch is a carbohydrate extracted from corn,” Xavier explains. “It’s frequently used in cosmetics as an absorbent.” That means it helps thicken the product just enough to stick to your skin. 8) Water: This provides a liquid base for the product. 9) Magnesium Carbonate: “Magnesium carbonate is added to help the product spread easier,” Stagg explains. “It’s non-toxic.” An expert panel at the Cosmetic Ingredient Review found magnesium carbonate to be safe and non-irritating when coming into contact with the skin. 10) Isopropyl Myristate: This ingredient is a skin conditioning agent that can be synthetically made or sourced from myristic acid (a naturally-occurring fatty acid). It’s particularly good at reducing the greasy feel caused by a high oil content in a product, and it’s generally considered to be safe. But people with oily skin beware: It tends to cause blackheads by blocking the pores. 11) Aminomethyl Propanol: An acidity regulator that keeps products fresh by inhibiting corrosion of the can, container or dispenser. “It can irritate some people’s eyes, skin and lungs,” Stagg says. But one more time: As long as you avoid spraying your face or sensitive areas with the stuff, you should be A-okay. 12) Dimethicone: Similar to isopropyl myristate and magnesium carbonate, dimethicone softens the skin and makes the product more spreadable. “It’s gentle on the skin and unlikely to clog your pores,” Xavier says. 13) Sodium Benzoate: Sodium benzoate is widely used as a preservative. “The Cosmetic Ingredient Review panel considers this ingredient to be safe for use in cosmetics, because it rapidly metabolizes (it’s non-bioaccumulative),” Xavier adds. OFF! Insect Repellent is made up almost entirely of irritants, but this should surprise no one — bug spray is meant to annihilate bugs, so spraying it into your eye might hurt a little bit. All said and done, though, as long as you use this insect repellent as directed, the pros (not being eaten alive by mosquitoes) seem to outweigh the cons (potentially experiencing a minor rash).